This past Friday night, May 16th, I went to Scullers to see the Christian McBride Trio. The show was out of this world, and I got to sit right in front of Christian McBride- the best seat in the club! Christian McBride is a bassist and virtuoso. He is a 3-time Grammy award winner and has appeared on over 300 recordings as a sideman. His trio also includes Pianist Christian Sands and drummer Ulysses Owens, Jr. The concert showcased McBride's new album, "Out Here". Here's a video of McBride describing his new album. His website also describes his new release. The band played a mix of originals and standards. They started off with a bluesy number called "Ham hocks and cabbage". I liked how every song had a very clear melody, and intense rhythmic drive. When Christian McBride and Christian Sands played in unison, they fully complimented each other, and well it was on point. I also loved how when everyone took solos, they were very bluesy, rhythmic, and used strong melodic ideas. Sometimes their solos sounded like they wrote another tune- they were so strong and catchy! Sands communicated a lot during his solos. He seemed to play phrases to get a reaction out of the rest of the trio. And everyone else would smile and egg him on, like they were actually having a conversation. Now I always hear a lot about how jazz is communicative, but I rarely see something at the level I saw in McBride's trio. When the trio played, there seemed to be some kind of inside joke occurring, which as an audience member made me laugh along. 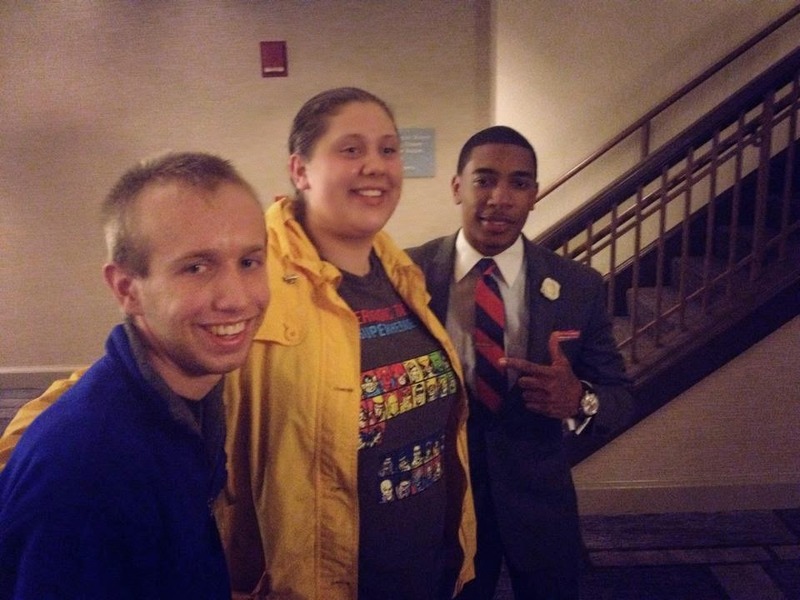 Meeting Christian Sands after the show! The band then went on to play Thelonious Monk's great song, "I Mean You". I am pretty much obsessed with listening to Monk, so this song made me very ecstatic to hear their interpretation of this edgy standard. I loved how the drummer, Ulysses Owens, Jr. would play a drum solo that sounded like a song. Most drummers I hear in concert do have amazingly rhythmic solos, but seldom do I hear a drummer that I can recognize a song in the midst of the cymbals and toms. During the concert, McBride won a "Bassist of the Year Award", from the Jazz Journalist's Association- and rightfully so, he is amazing! Throughout the entire concert he would play things that made me wonder, "I'm pretty sure that's impossible, but he just played the impossible!" 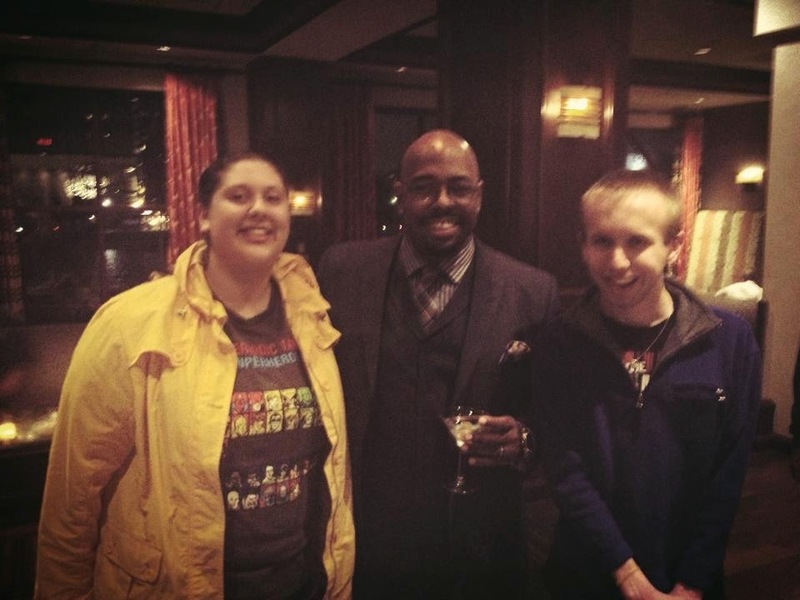 Meeting Christian McBride after the show! I learned that Christian McBride was in Freddie Hubbard's band for a couple of years. Consequently, McBride decided to honor Hubbard by playing "Povo", from Hubbard's album "Sky Dive". This song was groove based, and led to some funky solos. The trio then went onto a blazing fast rendition of "Cherokee". I was amazed not only by the sheer technique of the trio, but the tastefulness of everything they played. When they played fast runs they weren't done in a meaningless way- they built energy and led to strong melodic statements. The ballad of the night was "Who Can I Turn to When Nobody Needs Me". McBride joked about having to use a rental instrument when he goes on tour, and how he had never used the bass for the concert before. He got out his bow, played a couple of notes, and decided the bow worked well enough. Surely this display would concern some people, but what resulted was an incredibly haunting, genuine performance. McBride played the loving melody with the bow, which provided a deep, singing sound. Sands followed this with a lush, building solo, that seems to respond to the lyrics: "Who can I turn to when nobody needs me? My heart wants to know and so i must go where destiny leads me". I didn't catch the name of the last song, but it was burning I can tell you that! I had the immense pleasure of meeting the entire trio after the show, and I was astounded by how genuinely nice and encouraging everyone was. You can tell the happiness they emit through their music is a natural part of their personalities because they were all so happy. And being around that kind of happiness that night made me feel not only overjoyed, but energetic. I want to get to that level where my music makes people that happy, and makes people laugh. Check out this awesome album! I don't listen to jazz because I like hearing the technique or harmonic substitutions, or any of the concrete kind of stuff- I listen to jazz because it makes me happy and it makes me laugh. Like I said, the concert seemed like I was part of an inside joke, and hearing those comical conversations made me laugh. I'm going to be bold and say that was one of the best concerts I have ever attended! Thank you for this very kind review. I'm glad you enjoyed the performance and it was a pleasure to meet you. It means a lot that you read my blog, and I am very happy to have seen and met you.